Razer's second-generation Blade is an ultraportable, high-performance Windows 8 laptop packed into a slim body that any Apple engineer would envy. It's better than the original Blade in just about every respect: It's sleeker, lighter, and more powerful, thanks to a fourth-generation Core processor. And it loses the obtuse Switchblade LCD touchpad that made the old Blade--now rechristened the Blade Pro--so quirky. The Blade is two-thirds of an inch thick and weighs roughly 4.25 pounds. Toss it in your bag along with its diminutive power adapter and the whole package tops out at just over five pounds. Although the Blade is a pound and a half heavier than the 13-inch MacBook Air, it is thinner than the Air by 0.02 inches at its thickest point. In practice, however, Apple's ultraportable feels skinnier because of the way its unibody chassis tapers down to such a knife edge--a design that leaves me with the irrational feeling that I'm going to cut myself. Razer's emerald-and-black design aesthetic is in full effect here, with a green-backlit keyboard sitting atop a matte black aluminum chassis. Inside this literally hot piece of hardware is a quad-core Intel Core i7-4702MQ processor, an Nvidia GeForce GTX 765M GPU, and 8GB of DDR3/1600 memory. The chassis gets very warm when the GPU kicks in, despite the best efforts of an intake fan on the bottom of the unit that exhausts heat through vents near the sturdy display hinges. Still, you'll want to keep your fingers off the aluminum strip between the keyboard and screen while playing StarCraft II. We applaud the inclusion of a 256GB SSD, HDMI output, and three USB 3.0 ports (we'll even forgive their garish pigment), but the absence of hardwired ethernet means you'll be downloading all your software via Wi-Fi. That will be no fun considering that many modern PC games push 10 to 20GB. Razer's decision to outfit the Blade with a cheap TN (twisted nematic) panel is disappointing, doubly so when you consider the resolution of the 14-inch display is limited to 1600 by 900 pixels (although that's better than what Alienware delivers on its new 14-inch model, which also uses a TN panel). The screen looks decent enough when viewed straight on, but move your head more than a few inches in any direction and colors quickly fade and bleed together into an unattractive gray morass. It's not a problem if you're just browsing reddit, but having to regularly adjust the screen to keep your eyes in the sweet spot spoils the fun of playing a visually striking game like BioShock Infinite on your lap. Then again, you get to play visually striking games like BioShock Infinite on a super-thin computer that fits comfortably on your lap. Razer deserves credit for making good on its promise to deliver the world's most powerful ultraportable gaming laptop. The extra gaming-focused features built into the Blade are a nice touch: You can crank the stereo speakers nice and loud, and the keyboard is fully programmable through the included Razer Synapse 2.0 software. The anti-ghosting feature built into the keyboard enables the Blade to recognize multiple keypresses at the same time, which means you don't have to worry quite as much about hitting the wrong key in the heat of a fervent League of Legends match. The keys themselves are small and comfortable to type on, with enough travel that you can touch-type with confidence. You can dim or shut the backlight off entirely if you don't feel like advertising your membership in the Cult of Razer. Sadly, the green glowing Razer logo on the lid cannot be killed. 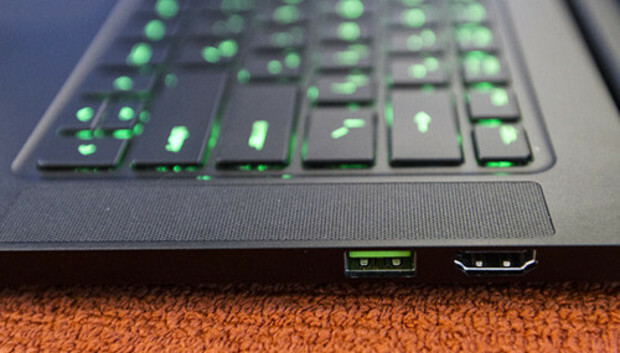 As reviewed, Razer expects to fetch a cool $2,000 for the Blade. That's not bad when you consider it earned an excellent score of 414 in our Notebook WorldBench 8.1 benchmarking suite. That score indicates that it's roughly four times faster the mainstream Asus Vivobook S550CA we use for a reference notebook, and it's on par with the performance of the fastest notebook we've tested to date: The CyberPower FangBook EVO HX7-200. The FangBook, which sells for $1550, has a larger display (17-inches, with native resolution of 1920 by 1080 pixels), a faster CPU and GPU, and more memory, but it also tips the scales at more than 10 pounds and looks about as elegant as a water buffalo. Goofy green glow and its TN panel aside, the Blade is the most practical laptop Razer has ever made. Like the 17-inch Pro, it functions equally well as a gaming laptop or a high-powered Windows 8 work machine, but the 14-inch Blade has the advantage of being small enough to use in a coffee shop or on an airplane (we measured battery life at more than 4.5 hours) without irritating your neighbors. And while it doesn't sport the touchscreen or the funky peripherals of the Razer Edge Pro, the Blade is more powerful and far more comfortable to use than Razer's Windows 8 gaming tablet.